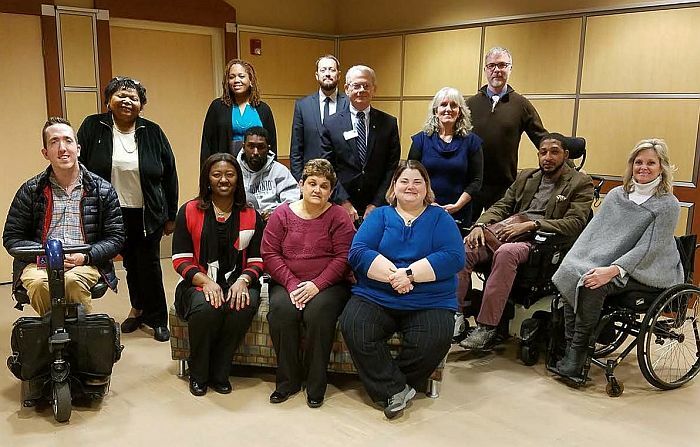 The Virginia State Rehabilitation Council (SRC) is a group of individuals, most of whom have disabilities, appointed by the Governor to work on behalf of people with disabilities by serving as a source of advice, information, and support for the Commonwealth's Department for Aging and Rehabilitative Services vocational rehabilitation and supported employment programs. The SRC constantly is searching for ways to communicate with DARS consumers, other people with disabilities, and those who support them. The mission of the Virginia State Rehabilitation Council, in partnership with the Department for Aging and Rehabilitative Services, and in collaboration with advocacy groups, consumers and their families, is to ensure quality services for Virginians with disabilities to achieve meaningful employment, self-sufficiency and independence. All Virginians with disabilities have access to quality services leading to meaningful employment, self-sufficiency and independence. As a result of amendments to the federal Rehabilitation Act in 1992, each state has a citizens' advisory council for its vocational rehabilitation agency. In Virginia, the State Rehabilitation Advisory Council for the Commonwealth's Department of Rehabilitative Services (DRS) was established by the General Assembly in its 1994 session. When the Rehabilitation Act was reauthorized as part of the Workforce Investment Act of 1998, the role of this citizens' council -- now called a State Rehabilitation Council -- was strengthened in order to underscore its importance in providing public input and advice to the state vocational rehabilitation agencies. Download a copy of the SRC Bylaws. Representatives of disability groups that include a cross-section of individuals with physical, cognitive, sensory, and mental disabilities; representatives of individuals with disabilities who have difficulty representing themselves or are unable due to their disabilities to represent themselves; and current or former applicants for, or recipients of, vocational rehabilitation services. One representative each from the federal Client Assistance Program at the disAbility Law Center of Virginia; the Statewide Independent Living Council; the Virginia Board of Workforce Development; the Department of Education; the parent training and information center; the Employment Services Organizations; and a qualified counselor from the state's vocational rehabilitation department. A majority of the members of the SRC must be people with disabilities. The Vocational Rehabilitation (VR) Program was established under Title I of the Rehabilitation Act of 1973 as amended, and provides vocational rehabilitation services to eligible individuals with disabilities so that they may prepare for and engage in gainful employment. The DARS VR program provides direct services to consumers through its field offices located throughout the Commonwealth. Wilson Workforce and Rehabilitation Center provides consumers with residential or outpatient programs ranging from early medical rehabilitation to complete vocational services and re-entry into the community. The VR program provides a comprehensive range of services, including vocational evaluation, job placement, career counseling, vocational and academic training, rehabilitation and assistive technology, physical restoration and personal assistance services. In addition to its Division of Rehabilitative Services (DRS) program, DARS has strong partnerships with many community-based rehabilitation providers across the Commonwealth and supports facility-based employment and supported employment services for the Employment Services Organizations (ESOs), the community rehabilitation providers in Virginia. DARS also works closely with private, non-profit Centers for Independent Living which provide independent living skills, training, advocacy, information and referral and peer counseling for individuals with disabilities. The State Rehabilitation Council (SRC) works in partnership with the Department for Aging and Rehabilitative Services (DARS) to assess satisfaction with services received through the Division of Rehabilitative Services (DRS). Federal Fiscal Year (FFY) 2016 was the third year of assessing satisfaction for consumers in service delivery (post Individualized Plan for Employment but prior to Employment). Survey highlights are provided below. A detailed report is available at https://www.vadars.org/publications.htm#annualreports. Percentage of Consumers Responding "Yes"
Percentages of “Yes” responses are indicative of real time assessment (what was happening with consumers at the time of survey completion). Additionally, they are similar to the previous two-year average (FFY 2014 and 2015). Despite low “Yes” percentages, consumers continue to report the best thing that has happened to help them move towards their job goal and what would help them move closer to their goal. In terms of the best thing that has helped consumers move towards their goal, aspects of job preparation and helpfulness (counseling/support/helpful things) were mentioned most. Aspects of job preparation, training/education, and helpfulness were mentioned most for things that would help them move closer to their job goal. Transition of students with disabilities, including students with disabilities who are not in special education programs, from education to vocational rehabilitation. An important Attachment to the State Plan summarizes recommendations and advice provided by the SRC to DSRS, and presents the agency's response to these recommendations. Each year, DARS conducts special hearings for the purpose of obtaining public input into its State Plan. The SRC submits an Annual Report to the Commissioner of the federal Rehabilitation Services Administration and to the Governor of Virginia on the status of vocational rehabilitation programs operated within the state. SRC meetings are held quarterly. Meetings are generally scheduled to occur at 8004 Franklin Farms Drive, Richmond, Virginia, in the first floor conference room. The location of the meeting is accessible. Interpreter services will be provided, and other accommodations may be requested prior to the meeting. Agendas and minutes from the SRC's meetings are available to view or print on our SharePoint site.